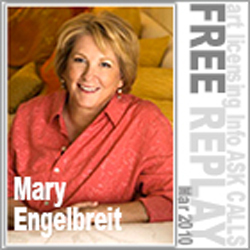 Once artist Mary Engelbreit focused her talent on greeting cards, success came quickly. As her card line grew in size and popularity, it drew attention from other companies anxious to license her artwork on a wide range of products including calendars, T-shirts, mugs, gift books, rubber stamps, ceramic figurines, fabric and a list that’s grown to include nearly 6,500 products over the years, with more than $1 billion in lifetime retail sales. One of the top three most successful artists in art licensing . . . ever, Mary shares her insightful story in her own words, spanning 30+ years working from a one woman studio to managing a studio and huge licensing business. Mary touches on the digital age and how she has seen technology used in her business and art licensing – for efficiency and need to stay in touch with an ever-changing world.